Identification: Free floating, aquatic fern. Consists of horizontal stems that float just below the water surface, and produce a whorl of three leaves (technically fronds) at each node. The upper pair of floating or emergent leaves are green in color and ovate to oblong in shape. The lower submerged leaf is brown, highly divided and resembles and functions as a root. The lower leaves may grow to great lengths (up to 25 cm), and by creating drag, act to stabilize the plant (Mitchell and Tur 1975; Room 1983). 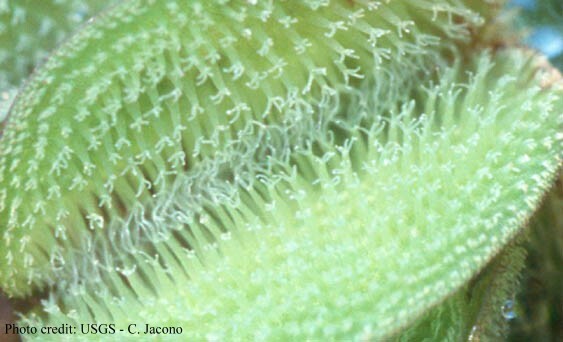 Upper surfaces of green fronds are covered with rows of white, bristly hairs (papillae) (Mitchell 1972), which divide into four thin branches that soon rejoin at the tips to form a cage. The resulting structures resemble tiny eggbeaters. This characteristic eggbeater structure can reliably distinguish S. molesta from the morphologically similar S. minima that has unjoined hairs (Wunderlin and Hansen 2011). These specialized hairs create a water repellent, protective covering (Mitchell and Thomas 1972). 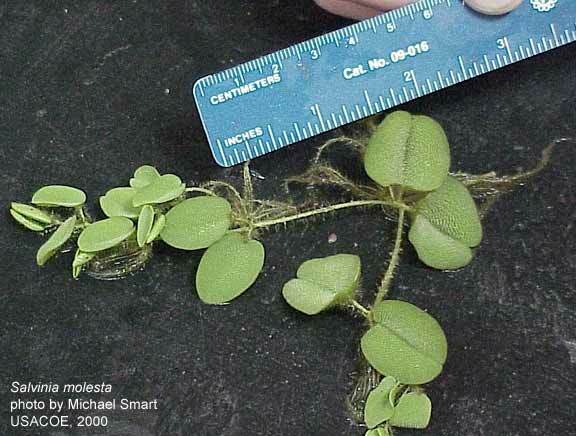 Salvinia molesta belongs to a group of closely related Neotropical species that share the feature of eggbeater type hairs (Mitchell 1972; Mitchell 1979). Named the “Salvinia auriculata complex”, the members include S. auriculata Aublet, S. biloba Raddi, S. herzogii de la Sota, and S. molesta. Although subtle differences have been found among the members of the group, sporocarps are generally needed to tell these species apart (Forno 1983; Mitchell 1972). Sporocarps develop in elongated chains among the submersed leaves. 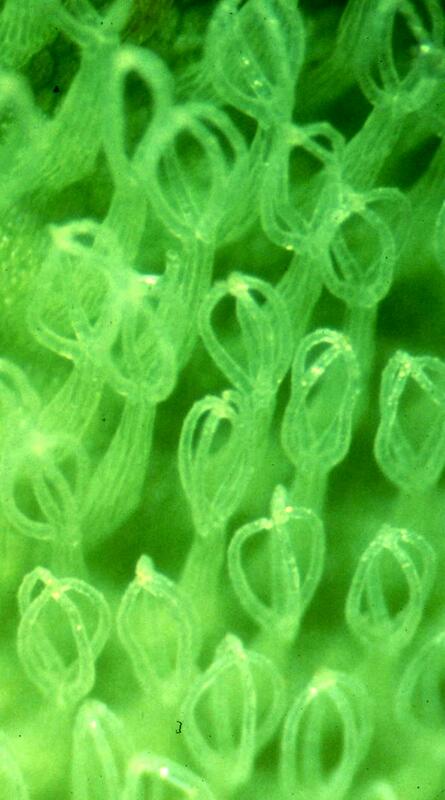 Salvinia molesta is known for its egg-shaped sporocarps that end in a slender point. 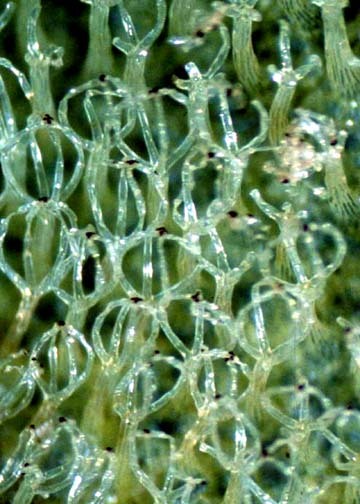 Mature plants can produce large quantities of sporocarps, which are actually outer sacs that contain numerous sporangia. However, the sporangial sacs are usually empty of microscopic spores or with only a few deformed remnants. Being a pentaploid species, S. molesta demonstrates irregularities during meiosis that prevent spore formation and result in functionally sterile plants (Loyal and Grewal 1966; Mitchell 1979). Table 1. States with nonindigenous occurrences, the earliest and latest observations in each state, and the tally and names of HUCs with observations†. Names and dates are hyperlinked to their relevant specimen records. The list of references for all nonindigenous occurrences of Salvinia molesta are found here. Ecology: Reproduction is strictly vegetative as spores are sterile (Mitchell 1979). Under favorable natural conditions, biomass can double in about one week to 10 days (Mitchell and Tur 1975; Mitchell 1979). Biomass weights of live plants approach those recorded for floating waterhyacinth (Eichhornia crassipes (Mart.) Solms) (Mitchell 1979). 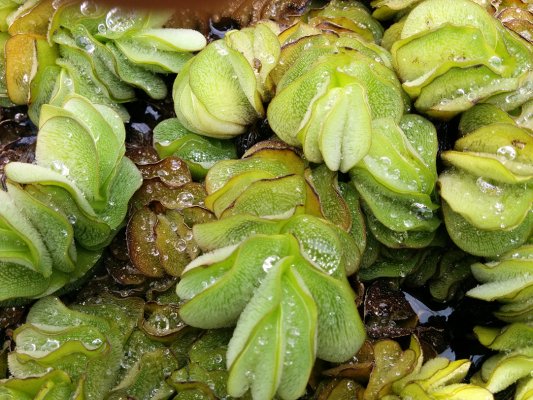 Salvinia molesta demonstrates tolerance to freezing air temperature, but cannot withstand ice formation on the water surface except when dense mats protect the underlying plants (Whiteman and Room 1991). Salvinia molesta is strictly a freshwater species, not tolerating brackish or marine environments. In experimental trials, salinity above 7 parts per thousand (ppt) slowed growth and damaged plant tissues. Higher salt concentrations proved lethal. Plants maintained at 11 ppt were killed after 20 hours exposure. Full strength seawater (35 ppt) killed plants in 30 minutes (Divakaran et al. 1980). Means of Introduction: The first establishment outside of its native range was in Sri Lanka in 1939 (Room 1990), by the Botany Department at the University of Colombo. The species continued to be introduced to other warm regions of the world intentionally as an aquarium and water garden plant, and unintentionally as a contaminant in shipments of other aquatic plants (Oliver 1993; Nelson 1984). Once established in a new region, the plant is likely spread as a hitchhiker on boats, trailers and other recreational gear. Local movement between waterbodies may be facilitated by birds and aquatic mammals (Mitchell and Thomas 1972). Spread will continue through natural drainage and flow in river and stream systems. In lakes and large water-bodies upright well buoyed leaves are effectively dispersed by wind and currents to infest new coves. Status: Populations established in the southeast and southwest U.S., including Guam, Hawaii, and Puerto Rico. Extirpated from colder climate states (Connecticut, District of Columbia, Kansas, Missouri, Virginia) and eradicated from Northern Alabama and California, and parts of the Carolinas, Florida, and Texas. More than 99% of the Pascagoula River population was killed by storm surge salinity or by being deposited on land during Hurricane Katrina in 2005, thus leaving about 2 hectares of S. molesta distributed over ~20 sites (Fuller et al. 2010). Impact of Introduction: Salvinia molesta has the potential to alter aquatic ecosystems in several ways. Rapidly expanding populations can overgrow and replace native plants resulting in dense surface cover that prevents light and atmospheric oxygen from entering the water. Decomposing plant material drops to the bottom, consuming dissolved oxygen needed by fish and other aquatic life (Divakaran et al. 1980). Flores and Carlson (2006) noted a 2.5 fold increase in dissolved oxygen by removing 90% of S. molesta at five east Texas sites. Floating mats of S. molesta can be up to one meter thick (Whiteman and Room 1991), impeding navigation, reducing water flow and interfering with fishing and recreational activities (Mitchell and Thomas 1972). This could be significant in areas where economic or subsistence fishing is important (Mitchell et al. 1980). Like dense floating mats of waterhyacinth, dense floating mats of S. molesta support secondary colonizing plants, leading to the formation of floating islands or tussocks (McFarland et al. 2004; Mitchell et al. 1980). Few have researched the beneficial effects of S. molesta. Due to its floating habit, S. molesta was utilized to treat sewage and industrial effluent (Finlayson et al. 1982). Asian countries have supplemented livestock fodder with S. molesta, and utilized it as a compost and mulch (Oliver 1993; Thomas and Room 1986). Anonymous. 2009. Salvinia control effort on Saline Lake proves successful. http://www.louisianasportsman.com/details.php?id=1806. Bister, T.J., and M.W. Brice. 2008a. Brandy Branch Reservoir 2007 Survey Report. Texas Parks and Wildlife Department, Austin, TX. http://www.tpwd.state.tx.us/publications/pwdpubs/lake_survey/pwd_rp_t3200_1253/index.phtml. Bister, T.J., and M.W. Brice. 2008b. Lake Pinkston 2007 Survey Report. Texas Parks and Wildlife Department, Austin, TX. http://www.tpwd.state.tx.us/publications/pwdpubs/lake_survey/pwd_rp_t3200_1360/. Brown, L.E., G. Nesom, S.J. Marcus, and D. Rosen. 2009. Plants of Trinity River National Wildlife Refuge. Trinity River NWR, US Fish and Wildlife Services, Liberty, TX. http://www.fws.gov/uploadedFiles/TRNWRPlants_2009.pdf.Calflora. 2015. Berkeley, California: The Calflora Database. http://www.calflora.org/. Accessed on 12/04/2015. Calflora. 2015. The Calflora Database. http://www.calflora.org/. Accessed on 12/04/2015. California Department of Food and Agriculture. 2004. Hydrilla eradication program annual report 2004 - Appendix II. California Department of Food and Agriculture, Sacramento, CA. https://www.cdfa.ca.gov/plant/IPC/hydrilla/hydrilla_rpt2004.htm. Caudales, R., E.V. Hernandez, A. Sanchez-Perez, and H.L. Liogier. 2000. Aquatic and wetland plants of Puerto Rico. I. Pteridophyta. Anales Jardin Botanico de Madrid 57(2). Consortium of California Herbaria. 2014. Consortium of California Herbaria. Consortium of California Herbaria, Berkeley, CA. Divakaran, O., M. Arunachalam, and N. Balakrishnan Nair. 1980. Growth rates of Salvinia molesta Mitchell with special reference to salinity. Proceedings of the Indian Academy of Sciences, Plant Sciences 89(3):161-168. Finlayson, C.M., T.P. Farrell, and D.J. Griffiths. 1982. Treatment of sewage effluent using the water fern salvinia. Water Research Foundation of Australia, Kingsford, New South Wales. Flores, D. and J.W. Carlson. 2006. Biological control of giant salvinia in east Texas waterways and the impact on dissolved oxygen levels. Journal of Aquatic Plant Management 44:115-121. Forno, I.W. 1983. Native distribution of the Salvinia auriculata complex and keys to species identification. Aquatic Botany 17:71-83. Fuller, P.L., M.G. Pursley, D. Diaz, and W. Devers. 2010. Effects of Hurricane Katrina on an incipient population of giant salvinia Salvinia molesta in the lower Pascagoula River, Mississippi. Gulf and Caribbean Research 22:63-66. Giant salvinia Task Force. 2002. Lower Colorado River Giant Salvinia Task Force Action Plan. Lower Colorado River Giant Salvinia Task Force. 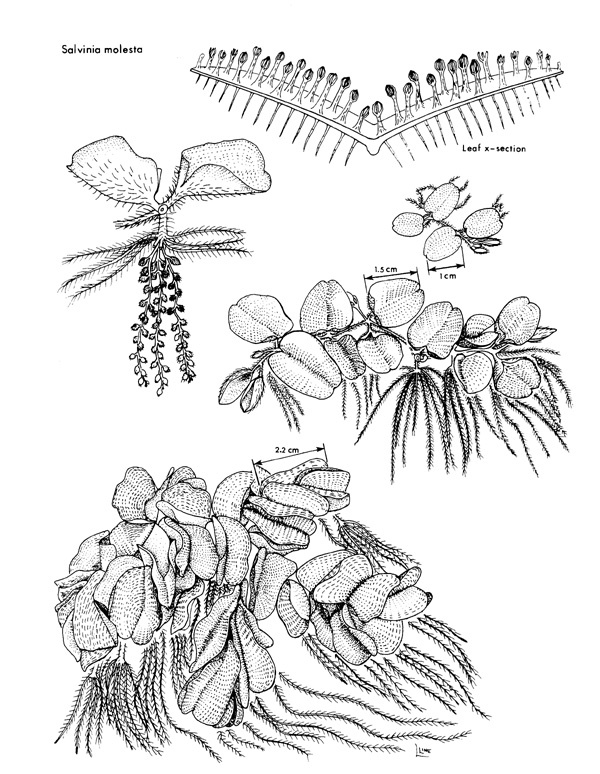 http://www.anstaskforce.gov/Species%20plans/Giant%20Salvinia.pdf (accessed on November 12, 2006). Heidgerd, D. 2015. Pesky invasive plant turns up in another east Texas waterway. NBCDFW.com. Fort Worth, TX. http://www.nbcdfw.com/news/local/Pesky-Invasive-Plant-Turns-Up-in-Another-East-Texas-Waterway-353166401.html. Created on 11/24/2015. Accessed on 11/24/2015. Johnson, D. 1995. Giant salvinia found in South Carolina. Aquatics 17(4):22. http://www.fapms.org/aquatics/issues/1995winter.pdf. Johnson, N.O. 2008. State to get tough to protect Caddo, other waterways. The Longview News-Journal, Longview, TX. 2008 (April 9). http://www.news-journal.com/news/content/news/stories/2008/04/09/04092008_lake_vegetation.html (accessed on 14 April 2008). Knight, S. 2008. Unwanted plant's impact swift. Tyler Morning Telegraph, TylerPaper.com, Tyler, TX. 2008 (February 14). http://www.tylerpaper.com/article/20080214/SPORTS0202/802130364. Louisiana State University Herbarium. 2010. Louisiana State University Herbarium - Vascular Plants. Louisiana State University, Baton Rouge, LA. Loyal, D.S. and R.K. Grewal. 1966. Cytological study on sterility in Salvinia auriculata Aublet with a bearing on its reproductive mechanism. Cytologia 31(3):330-338. Lund University. 2010. Lund Botanical Museum. Lund University, Lund, Sweden. Madsen, J.D, R.M. Wersal, and W. Robles. 2006. Distribution of hydrilla and giant salvinia in Mississippi in 2005. GeoResources Institute . http://www.gri.msstate.edu/information/pubs/docs/2006/AnnualReport_MSBPI_2005.pdf. McFarland, D.G., L.S. Nelson, M.J. Grodowitz, R.M. Smart, and C.S. Owens. 2004. Salvinia molesta D. S. Mitchell (giant salvinia) in the United States: a review of species ecology and approaches to management. U.S. Army Corps of Engineers, Engineer Research and Development Center, Vicksburg, MS. http://el.erdc.usace.army.mil/elpubs/pdf/srel04-2.pdf. Mitchell, D.S. 1972. The Kariba weed: Salvinia molesta. British Fern Gazette, 10, 251-252. Mitchell, D.S. 1979. The incidence and management of Salvinia molesta in Papua New Guinea. FAO Report to the Office of the Environment and Conservation, Papua New Guinea. Mitchell, D.S., T. Petr, and A.B. Viner. 1980. The water-fern Salvinia molesta in the Sepik River, Papua New Guinea. Environmental Conservation 7(2):115-122. Mitchell, D.S. and P.A. Thomas. 1972. Ecology of water weeds in the neotropics. Volume 12. United Nations Educational, Scientific and Cultural Organization, Paris, France. Mitchell, D.S. and N.M. Tur. 1975. The rate of growth of Salvinia molesta (S. Auriculata Auct.) in laboratory and natural conditions. The Journal of Applied Ecology 12(1):213-225. National Agricultural Pest Information System. 2007. Alabama state survey map for Salvinia molesta (S. auriculata complex). US Department of Agriculture Animal & Plant Health Inspection Service, Plant Protection & Quarantine, and Cooperative Agricultural Pest Survey (CAPS), West Lafayette, IN. http://ceris.purdue.edu/napis/maps/stsurvey.html. Created on 02/05/2007. Accessed on 02/12/2008. Nelson, B. 1984. Salvinia molesta Mitchell does it threaten Florida? Aquatics 6(3):6-8. http://www.fapms.org/aquatics/issues/1984fall.pdf. New York Botanical Garden. 2015. The New York Botanical Garden Herbarium (NY) - Vascular Plant Collection. The New York Botanical Garden, New York, NY. Oliver, J.D. 1993. A review of the biology of giant salvinia (Salvinia molesta Mitchell). Journal of Aquatic Plant Management 31:227-231. Peck, J.H. 2011. New and noteworthy additions to the Arkansas fern flora. Phytoneuron 30:1-33. Room, P.M. 1983. Falling Apart as a Lifestyle: The rhizome architecture and population growth of Salvinia molesta. The Journal of Ecology 71(2):349-365. Room, P.M. 1990. Ecology of a simple plant-herbivore system: biological control of salvinia. Tree 5(3):74-79. Rucker, J. 2008. State steps up fight against Salvinia on Lake Bistineau: seventeen spray crews attack the weed. The Times, Shreveport, LA. 2008 (April 8). http://www.shreveporttimes.com (accessed on 14 April 2008). Smith, C. 2009. Giant Salvinia outbreak threatening Texas lakes. News-Journal.com, Longview News Journal, Longview, TX. 2009 (April 23). http://www.news-journal.com/sports/content/sports/stories/2009/04/23/04232009_cksoutdoors.html (accessed 29 April 2009). South Carolina Department of Natural Resources (SC DNR). 2007. South Carolina Aquatic Plant Management Plan. South Carolina Department of Natural Resources, Columbia, SC. http://www.dnr.sc.gov/water/envaff/aquatic/plan.html. Texas Parks and Wildlife Department. 2009. Sam Rayburn catches case of giant salvinia. Lone Star Outdoor News. Dallas, TX. 6(5):4. http://www.lsonews.com/images/stories/issues/oct2309.pdf. Created on 10/23/2009. Thomas, P.A. and P.M. Room. 1986. Taxonomy and control of Salvinia molesta. Nature 320(6063):581-584. University of Alabama Biodiversity and Systematics. 2007. Herbarium (UNA). University of Alabama, Tuscaloosa, AL. University of South Carolina. 2016. A. C. Moore Herbarium (USCH). University of South Carolina, Columbia, SC. http://www.herbarium.org. Whetstone, J.M., S.J. de Kozlowski, and C.A. Aulbach. 1999. Eradication of Salvinia molesta from a small pond in Colleton County, South Carolina. Page 13 in Abstracts of the Aquatic Plant Management Society, Inc. thirty-ninth annual meeting, July 11-14, 1999. Asheville, North Carolina. Whiteman, J.B. and P.M. Room. 1991. 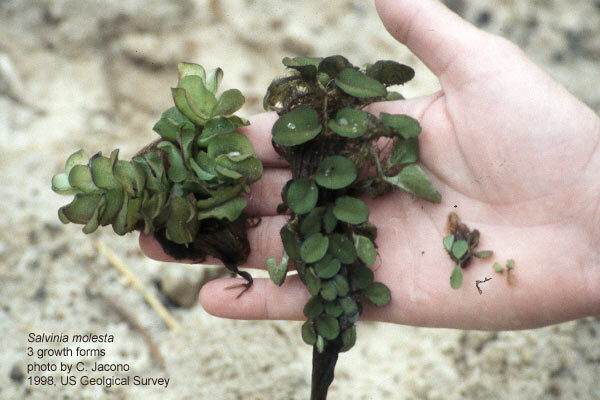 Temperatures lethal to Salvinia molesta Mitchell. Aquatic Botany 40:27-35. Wunderlin, R.P. and B.F. Hansen. 2011. Guide to the Vascular Plants of Florida. 3rd edition. University Press of Florida, Gainesville, FL.